The topic was the Nasdaq Composite Index; specifically, what’s behind the recent rally in the technology-heavy index. As I told the Fox Business host, this is one of the most underappreciated rallies in recent memory. 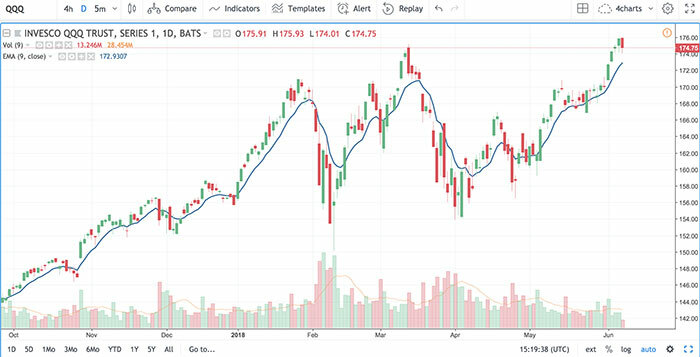 To be clear, there’s been quite the turnaround since early April, when concerns over data privacy at Facebook Inc. (Nasdaq: FB) and sluggish iPhone sales at Apple Inc. (Nasdaq: AAPL) led to a 12% pullback in the Nasdaq from its March 13 highs. The macro picture wasn’t (and still isn’t) any rosier, as investors grappled with a looming trade war, and a Federal Reserve potentially increasing the pace of rate hikes in response to stronger-than-expected job growth. Yet, all of those fears have subsided lately as the Nasdaq registered higher closes in 20 of its last 24 trading days, posting a 10% gain in the past month. That’s been enough to push the index to an all-time high, eclipsing the previous record set in March. These gains look likely to continue for the foreseeable future for a few reasons. Tech earnings, most of which were reported in late April, have been much better than expected, clocking in at an annual rate of 23%, thanks in large part to the Trump tax cuts and surging cloud businesses. Microsoft Corp. (Nasdaq: MSFT) beat earnings and reported a 93% growth in its Azure cloud business revenue. Amazon.com Inc. (Nasdaq: AMZN) reported strong growth in cloud services and advertising, while raising its Prime subscription annual price to $119 per year. Even though investors worried about Apple’s sluggish iPhone sales, the tech giant committed to returning $100 billion to shareholders in the form of stock buybacks. Notably, this $100 billion is the same number that’s been paid out to developers in the 10 years since the App Store’s inception. As Apple closes in on a $1 trillion market valuation, the company and its products have become a giant economy. If Apple were its own country, its $233 billion in annual revenues would put it as the world’s No. 50 economy, just behind Egypt and ahead of Peru. Structurally, the market is dominated by large index funds. There are now more than 5,000 indexes and only 3,500 stocks. As money enters the market through these indexes, it flows disproportionately to the mega-cap tech stocks that make up a large part of these funds. As these large stocks take in more money, they become more expensive whether or not their business warrants a higher multiple. The same also applies to the downside, as money leaving the markets has a greater impact on mega-cap tech. The technicals underpinning the recent rally look favorable. Several “fear and greed” indicators remain neutral, and we haven’t witnessed the extreme greed that typically occurs at market tops. The CBOE Nasdaq 100 Volatility Index (VXN) remains elevated at 16.29. This is 50% higher than a low reading of 12 earlier this year. A higher reading in this volatility index means that investors are still concerned about the future direction of stocks and haven’t fully embraced this rally. The economic backdrop is also favorable. Job growth has been better than expected, and the unemployment rate is at 3.8%, a level not seen since April 2000. Fears of higher interest rates have dissipated, and the U.S. 10-year Treasury note, at 2.96%, is still under 3%. This allows fund managers to continue their “there is no alternative” chant and buy stocks. Last, but not least, demographic trends are favorable. Millennials are growing up, moving out of their parents’ basements and entering the workforce. The National Association of Realtors reports that millennials are purchasing more homes than any other generation, making up 36% of homebuyers last year, up from 32% in 2013. As these millennials survey the investment landscape looking for additional places to sock away their savings, they are more likely to invest in the familiar mega-tech companies that have become a daily part of their lives. Editor’s Note: After 25 years of working on Wall Street, legendary investor Paul Mampilly is finally revealing one of his most closely guarded secrets. Paul has never shared anything before about how his method works, how he discovered it, or the lightning-fast triple- and quadruple-digit gains it has generated for him at breakneck speed. But during an invitation-only online broadcast at 1 p.m. EDT on June 12, Paul will lay out the exact process of implementing his method to turn every $5,000 invested into upward of $200,000 in the months ahead. This event is FREE to attend … but you must secure your spot before June 11. After that, attendance will be closed. To lock in your seat, click here now.